A snapshot from a simulation of the churning gas that blankets a star 80 times the sun’s mass. Intense light from the star’s core pushes against helium-rich pockets in the star’s exterior, launching material outward in spectacular geyser-like eruptions. The solid colors denote radiation intensity, with bluer colors representing regions of larger intensity. The translucent purplish colors represent the gas density, with lighter colors denoting denser regions. Image: Joseph Insley, Argonne Leadership Computing Facility. Three-dimensional (3D) simulations run at two of the U.S. Department of Energy’s national laboratory supercomputing facilities and the National Aeronautics and Space Administration (NASA) have provided new insights into the behavior of a unique class of celestial bodies known as luminous blue variables (LBVs) — rare, massive stars that can shine up to a million times brighter than the Sun. Astrophysicists are intrigued by LBVs because their luminosity and size dramatically fluctuate on a timescale of months. They also periodically undergo giant eruptions, violently ejecting gaseous material into space. Although scientists have long observed the variability of LBVs, the physical processes causing their behavior are still largely unknown. According to Yan-Fei Jiang, an astrophysicist at UC Santa Barbara’s Kavli Institute for Theoretical Physics, the traditional one-dimensional (1D) models of star structure are inadequate for LBVs. Instead, Jiang is leading an effort to run first-principles, 3D simulations to understand the physics behind LBV outbursts — using large-scale computing facilities provided by Lawrence Berkeley National Laboratory’s National Energy Research Scientific Computing Center (NERSC), the Argonne Leadership Computing Facility (ALCF), and NASA. NERSC and ALCF are DOE Office of Science User Facilities. In a study published in Nature, Jiang and his colleagues from UC Santa Barbara, UC Berkeley, and Princeton University ran three 3D simulations to study three different LBV configurations. All the simulations included convection, the action when a warm gas or liquid rises while its cold counterpart sinks. For instance, convection causes hot water at the bottom of a pot on a stove to rise up to the top surface. It also causes gas from a star’s hot core to push to its outer layers. During the outburst phase, the new 3D simulations predict that convection causes a massive star’s radius to irregularly oscillate and its brightness to vary by 10 to 30 percent on a timescale of just a few days — in agreement with current observations. “Convection causes the star to expand significantly to a much larger size than predicted by our 1D model without convection. As the star expands, its outer layers become cooler and more opaque,” Jiang said. Opacity describes how a gas interacts with photons. The researchers discovered that the helium opacity in the star’s outer envelope doubles during the outburst phase, making it more difficult for photons to escape. This leads the star to reach an effective temperature of about 9,000 degrees Kelvin (16,000 degrees Fahrenheit) and triggers the ejection of mass. Massive stars require massive and expensive 3D simulations, according to Jiang. So he and his colleagues needed all the computing resources available to them, including about 15 million CPU hours at NERSC, 60 million CPU hours at ALCF, and 10 million CPU hours at NASA. In addition, NERSC played a special role in the project. In addition to spending about 5 million CPU hours at NERSC on the early phase of the project, Jiang’s team used another 10 million CPU hours running part of the 3D simulations. Even so, Jiang believes that 3D simulations are worth the expense because illuminating the fundamental processes behind LBV outbursts is critical to many areas of astrophysics — including understanding the evolution of these massive stars that become black holes when they die, as well as understanding how their stellar winds and supernova explosions affect galaxies. Jiang also used NERSC for earlier studies, and his collaboration is already running follow-up 3D simulations based on their latest results. These new simulations incorporate additional parameters — including the LBV star’s rotation and metallicity — varying the value of one of these parameters per run. For example, the speed from rotation is larger at the star’s equator than at its poles. The same is true on Earth, which is one of the reasons NASA launches rockets from Florida and California near the equator. “A massive star has a strong rotation, which is very different at the poles and the equator. So rotation is expected to affect the symmetry of the mass loss rate,” said Jiang. The team is also exploring metallicity, which in astrophysics refers to any element heavier than helium. Meanwhile, Jiang and his colleagues already have new 2018 data to analyze. And they have a lot more simulations planned due to their recent allocation awards from INCITE, NERSC, and NASA. “We need to do a lot more simulations to understand the physics of these special massive stars, and I think NERSC will be very helpful for this purpose,” he said. This is a reposting of my news feature originally published by Berkeley Lab’s Computing Sciences. 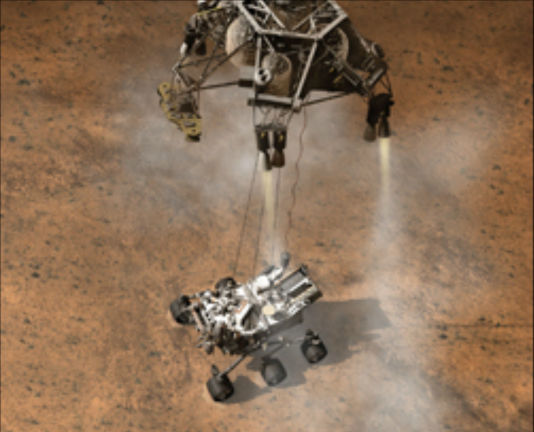 Many medical treatments — in their current form — would be unfeasible on deep space missions, such as a journey to Mars. How will we diagnose and treat the ailments of future space travelers? And what medical issues will they likely encounter? I posed these questions to Sandip Panesar, MD, a postdoctoral research fellow at Stanford who wrote a recent article about surgery in space in the British Journal of Surgery. What inspired you to research surgery in space? “From a young age, I’ve always been interested in space travel. I also have a background in surgery, trauma and emergency medicine. So it just clicked one day when I was reading about SpaceX. I realized they may actually send people to Mars, so we need to consider the medical implications of that. Specifically, how would you perform surgery? What adverse conditions do space travelers face? How does this extraterrestrial environment impact human physiology? An absence of gravity also causes the bones and muscles to atrophy. In addition, the makeup of white blood cells changes in space. Plus, the body produces more stress hormones, called glucocorticoids, which further weaken the immune system. This may negatively affect wound healing, which is critical to surgical recovery. 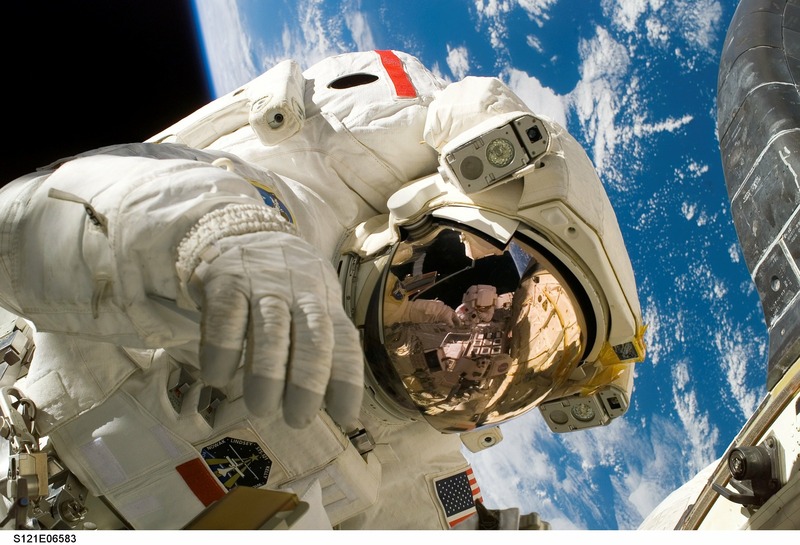 How can surgery be adapted for space? “One idea is to include a trauma pod, an enclosed medical suite, in the space station or vessel — a concept that originated in military medicine. Could surgical robots or other equipment help? “Mars is 48 million miles away and the radio signal delay is 20 minutes, so using robots controlled by surgeons on Earth isn’t feasible. Instead, researchers are developing robots that can perform surgery by themselves or with really minimal human assistance. There have already been trials of robots that can suture together pig bowels with minimal assistance. Would you want to be an on-board surgeon? NASA is making billions of measurements of both twins to see what space really does to the human body. And researchers hope that one day omics profiles will be conducted on a large scale in clinics, not just on astronauts, so we can switch from a “one size fits all” approach to personalized medicine. Photograph courtesy of reway2007 via a Creative Commons license. Whenever I think of meteor showers, I think years back to a perfect moment. I was crashed out with friends on a sandy beach alongside the Tuolumne River during a 2-day white water rafting trip. We were enjoying a balmy summer night as we lay on top of our sleeping bags, looking up at the amazing display of stars in a sky free of city light pollution. As we chatted and sipped wine, I noticed an incredibly bright “shooting star” flaming across the sky. Then another. And another. I’d never seen so many “shooting stars” (meteors). I stayed up most of the night to watch the nearly continuous celestial display. When I got home, I learned that it was actually an annual event – the prolific Perseid meteor shower. Meteor showers can appear anywhere in the sky. But if you trace their path, the meteors appear to come from the same region in the sky. In the case of the Perseids, the meteors appear to originate from the constellation Perseus. Meteor showers are caused by comets. As a comet orbits the Sun, it sheds a debris stream of ice and dust along its orbit. When Earth travels through this cloud of debris, the bits of interplanetary rock strike the Earth’s upper atmosphere where they are heated by friction and ignited. The Perseid meteor shower comes from the Swift-Tuttle, a huge comet with a nucleus of 26 km and meteoroids hitting our atmosphere at 132,000 mph. 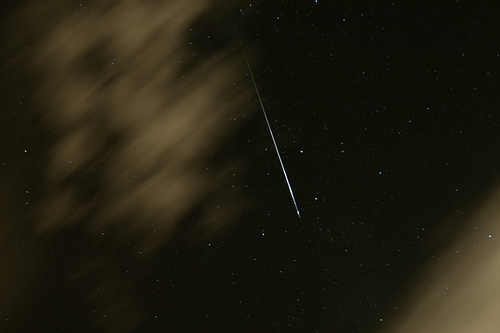 According to new research by NASA, the Perseids are the most prolific meteor shower. The number of resulting meteors can top 100 per hour. Although the meteor shower is active for several days, the peak will happen tonight through the early hours of tomorrow morning. A crescent moon will set shortly after midnight, leaving the skies dark for optimal viewing until pre-dawn. You just need to search out a secluded spot away from the glow of city lights, like a state or city park, then lie back and enjoy the show. When I tried to make lunch plans with a friend for next week, he didn’t know yet whether he could meet me. That’s because his plans depend on how smoothly the Curiosity rover lands on Mars tonight. His research team put together the Radiation Assessment Detector that is mounted on the top deck of the Curiosity rover. We still aren’t sure if life ever existed on Mars. From past missions, researchers know that there used to be water there. Now they want to determine if Mars once had the kind of environment that could be habitable or conducive for the formation of microbial life. The Curiosity rover is a car-like rover that will search Mars for past or present conditions favorable for life on the planet. It is basically a science lab on wheels, including 10 complex scientific instruments. These instruments are designed to study the chemistry of rocks, soil and atmosphere — searching for signs of past life on Mars. One of those scientific instruments is the Radiation Assessment Detector, which is designed to characterize the energetic particle spectrum at the surface of Mars. This will allow researchers to determine the radiation dose for humans at the planet surface, as well as provide input on the effects of particles on the surface and atmosphere. The surface is thought to have much higher radiation than Earth, since Mars has a thinner atmosphere and no global magnetic shield to divert charged particles. Although all research requires patience, hurling your research instrument at a far away planet requires both patience and guts. The landing may cause 7 minutes of terror, but the days of waiting must include its own nail-biting nervousness. When I get together with my friend for lunch, I’ll check his nails. Hopefully the landing will be a success, so he’ll be at the Jet Propulsion Laboratory for the next couple weeks though. I can wait. Photograph courtesy of the Exploratorium via Creative Commons. When viewed from the Earth, a solar eclipse happens when the Moon passes between the Sun and Earth so the Moon blocks the Sun. If the Moon only blocks part of the Sun, then it is a partial solar eclipse. 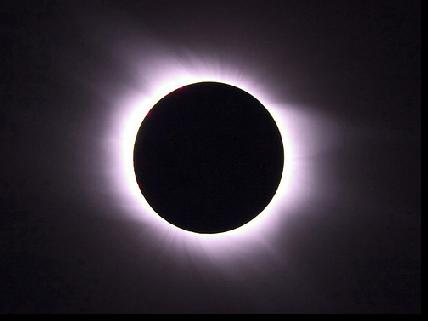 If the Sun is fully obscured by the Moon, then it is a total solar eclipse. Total eclipses are rare at any one location, because the Moon fully blocks the Sun along only a narrow path on the Earth’s surface traced by the Moon’s shadow. According to the National Aeronautics and Space Administration (NASA), a partial solar eclipse will occur on May 20, 2012. This is the first solar eclipse to happen in the United States since 1994. In San Francisco, this eclipse will begin at 5:15 pm and end at 7:40 pm. The maximum eclipse will occur at 6:32 pm when 85% of the sun will be obscured. This partial eclipse will look the like the Moon has a ring of fire surrounding it. Although it is tempting, you shouldn’t view a solar eclipse with the naked eye. Your eye-lens will concentrate the sun’s light onto your retina, and this can cause permanent eye damage. You can safely view a solar eclipse wearing inexpensive solar glasses (with a “CE” label), which have filters that block out 99.99% of the sun’s light and 100% of the harmful ultraviolet rays. Don’t have solar glasses? You can also safely view a solar eclipse by indirect projection – projecting the image of the sun onto a white piece of paper using a pinhole camera. The San Francisco Exploratorium has directions on how to make a pinhole camera. You can also view the partial solar eclipse at science centers, such as the Lawrence Hall of Science in Berkeley and the Chabot Space and Science Center in Oakland. Author Jennifer HuberPosted on May 20, 2012 August 11, 2013 Categories Event, Science Education, SpaceTags May 20, solar eclipseLeave a comment on The Eclipse is Coming!